Created by Drs. Spencer Silver and Art Fry, Post-it Notes hit the market in 1987 and became an instant success. While the two initially planned to use the adhesive for stick-on bookmarks, they quickly realized it had the potential for much wider use. They applied the adhesive to canary yellow scrap paper to create the very first sticky notes we know as Post-its. Since their creation, Post-it brand products have become an office staple that helps improve communication and productivity. 3M has worked hard to make Post-it a sustainable brand. All products are now made with 67 percent plant-based adhesive and 100 percent recycled paper. The company has also teamed up with Evernote to let users snap and save their Post-it Notes and create auto-tags, reminders and notebooks. 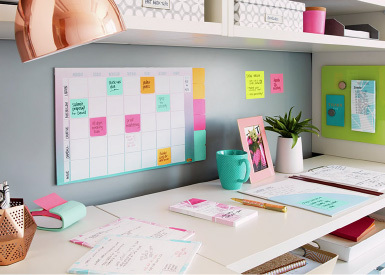 London Drugs carries a wide variety of Post-it products to keep you organized at work, school and home. Browse London Drugs’ selection of 3M Post-it Notes, Tabs, Page Markers and Flags and organize your life today.